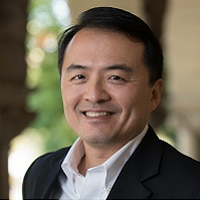 Dr. Wang is Director of the Center for Policy, Outcomes, and Prevention, and Associate Professor of Pediatrics and Medicine at Stanford University. He also co-chairs the mobile health and other new technologies group at the Stanford Center for Population Health Sciences. He received his B.S. degree from MIT, medical doctorate from Harvard Medical School, and PhD degree in policy analysis from RAND. After completing his pediatric residency training at the University of California, San Francisco, he worked in Greater China with McKinsey and Company. In 2000, he was recruited to serve as the project manager for the Taskforce on Reforming Taiwan's National Health Insurance System. He is a past recipient of the NIH Director’s New Innovator Award for creating mobile apps for health.